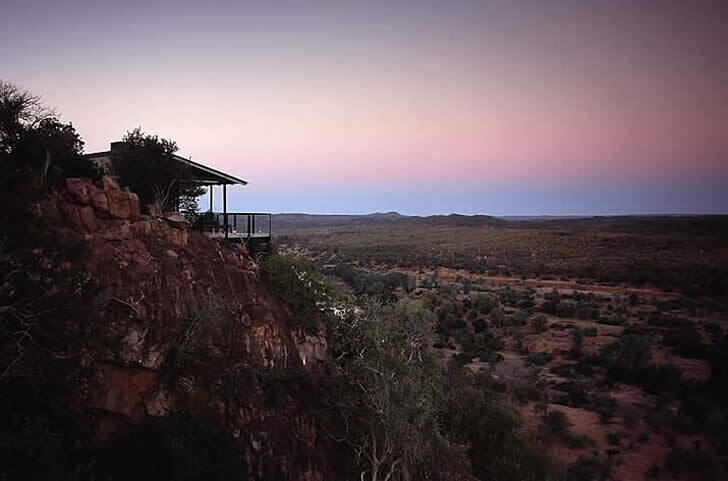 Thoroughly contemporary in nature, The Outpost writes its own definition of the 21st century safari lodge vernacular. Its architecture and interior design reinterpret the sophistication of a cosmopolitan boutique hotel and sympathetically transplant this into an untamed and remote setting. The Outpost is situated in the remote northern Kruger National Park, perhaps the most secluded of all the Kruger�s territories. Its wild and uncompromised landscape is characterised by billowing sour grass, thickets of ironwood trees virtually impenetrable in places, regal baobabs, colossal granite rocks, vast flood plains and two of the region�s most vital rivers, the Limpopo and the Luvuvhu, with their resident populations of hippo and crocodile. 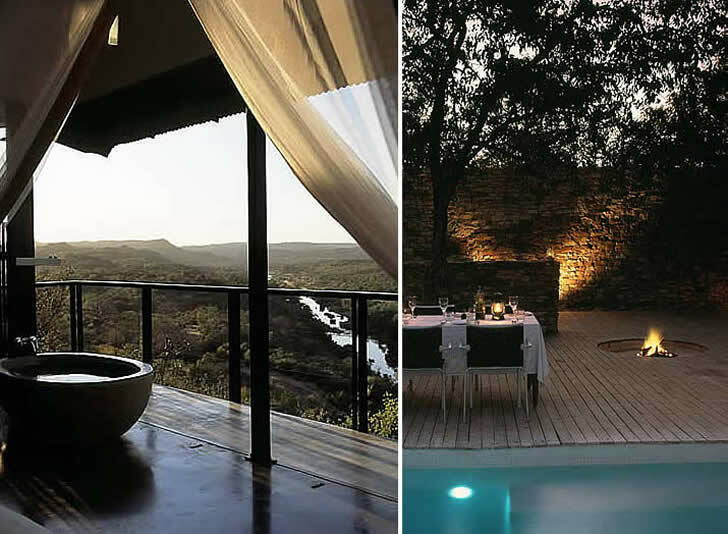 Rooms are perched high so as to better take in nature�s spectacle, which at times � when the fish eagle cries and the earth finally cools down with an almost palpable sigh � seems to be the manifestation not of reality, but of a glorious dream. From the ground up, The Outpost deliberately eschews any preconceived notions of the traditional. This is immediately apparent on viewing the prefabricated main structure and 12 free-standing guest suites, all of which are both graphic and Spartan in profile. The sense of modernity is further exaggerated by their elevated state on solid stilts of steel � a decision motivated by the steep lay of the land as well as a desire to optimise views and touch the earth lightly. The encounter between materials has also been rendered in a thoroughly up-to-date way. 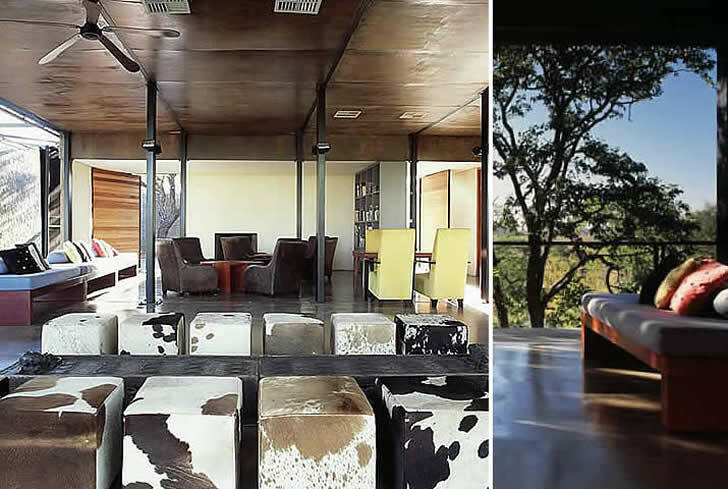 Timber, canvas and stonework may be materials shared by the majority of safari lodges, but in combination with steel, slabs of polished concrete and galvanised sheet metal, it is the powerfully modern overall composition and not its individual elements that elicits admiration. The principles of sustainable architecture guided Daffonchio�s hand during the entire design process: from the strict regulation of construction activities, careful water management, effective sun-orientation in order to minimise energy usage and a natural air-conditioning system, to the decisions to build around the trees and raise the lodge on stilts for a minimum footprint. 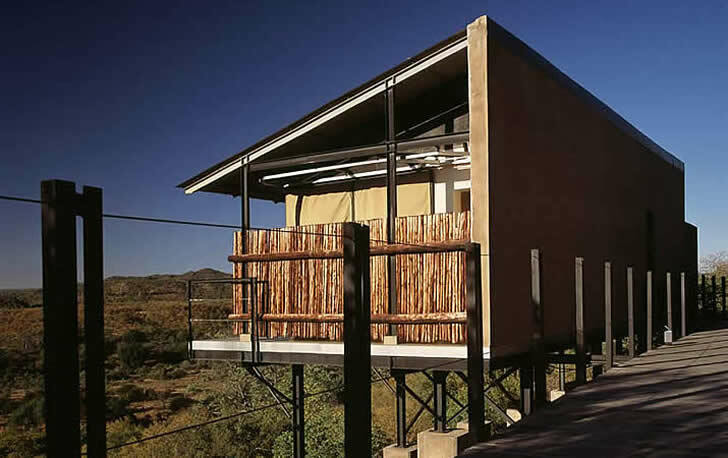 The concept of The Outpost was that of its original owners (the lodge has since been sold to a small consortium), innovative boutique hoteliers Christoff van Staden and Peter Aucamp. Their striking interior design echoes the contemporary sentiments of the architecture. Colours were deliberately chosen not to mimic those of the typical safari palette, so punchy blues and chic greys (rather than time-honoured khakis, ochres and dark mahogany) anchor the scheme. These are punctuated by pleasant shocks of primary brights as well as light-to-medium browns more typical of European than African interiors. Very little pattern or texture has found its way onto flat surfaces, bar a scattering of handembroidered and beaded feature cushions and the modern Nguni cowhide cubes that serve as seating around a low-slung Beninese table. The Outpost is part of a 30-year lease granted by the indigenous inhabitants of the land, the Makuleke people. Currently the community benefits from part of the lodge�s earnings as well as being trained in the ecotourism industry so as to effectively take the reins of this remarkable place when the concession ends.